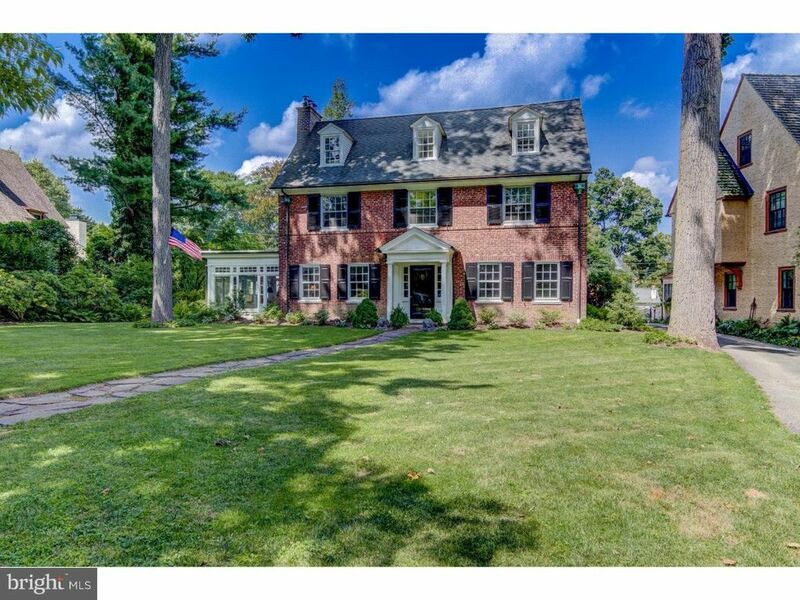 Located on one of Radnor's most popular streets, this stately 5 BD, 3.5 BA brick Georgian colonial has loads of historic architectural charm paired with modern amenities, including updated electrical, newer gas heat and newer central A/C. Gracious Center Entrance Hall with distinctive turned staircase has large cased openings to the formal Dining Room and Living Room with fireplace. A totally renovated and expanded Kitchen features a Bertazzoni 48 gas range, Thermador stainless refrigerator, Bosch dishwasher, and gas fireplace. The sun-drenched Den has walls of windows, French doors to the rear patio. There is also a 1st fl. Powder Room. Upstairs is a Master BD with walk-in closet, Master BA, and direct access to a Study/Dressing Room which could also be used as a BD or Nursery. 2 Hall BD share a Hall BA which has been renovated and has a closet with Washer/Dryer. The 3rd floor has 2 more BD and a Hall BA. Neutral d~cor and refinished wood floors, and large windows bathe this home in sunlight. The large basement has ample space for storage and could be finished for add'l living space. Large 2-car detached garage, charming playhouse. The rear patio overlooks the deep, beautifully landscaped rear yard. Residents of this coveted northside St. Davids neighborhood enjoy a warm sense of community and walkable access to train, parks, shops, schools, restaurants, and all the popular amenities in the charming village of Wayne. Centrally located in the heart of award-winning Radnor School District, this property is convenient to the Radnor Trail, Chanticleer Gardens, the Blue Route, Airport, & Center City.